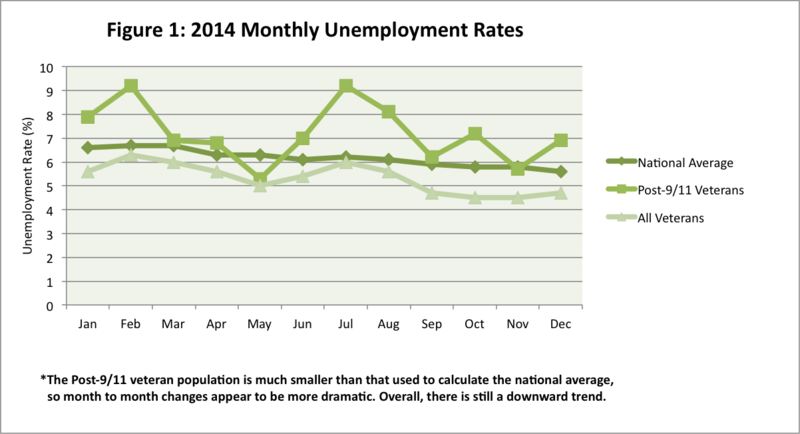 Overall, unemployment trends in 2014 have shown a positive trend for our nation. 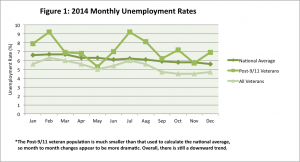 There has been a net decrease in the unemployment rate from January to December for the nation as a whole, veterans, and Post-9/11 veterans specifically. However, there is still much work to be done, especially in light of the service members now returning from Afghanistan who will need to transition to civilian jobs. While there was a net decrease in unemployment throughout 2014, Post-9/11 veterans experienced unemployment rates that were higher than those of both the greater veteran population and the national average overall. 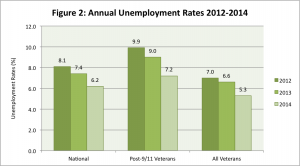 Post-9/11 veterans also experienced an end of year increase in unemployment (see Figure 1). For Post-9/11 veterans, the Bureau of Labor Statistics (BLS) reported that the unemployment rate increased from 5.7 percent in November to 6.9 percent in December 2014. Among all veterans, unemployment rates increased slightly, to 4.7 percent, while the national unemployment rate decreased from 5.8 percent to 5.6 percent. (It’s also important to note that the Post-9/11 veteran sample size for BLS is smaller than for other groups, and as such the unemployment percentages experience greater monthly fluctuations). 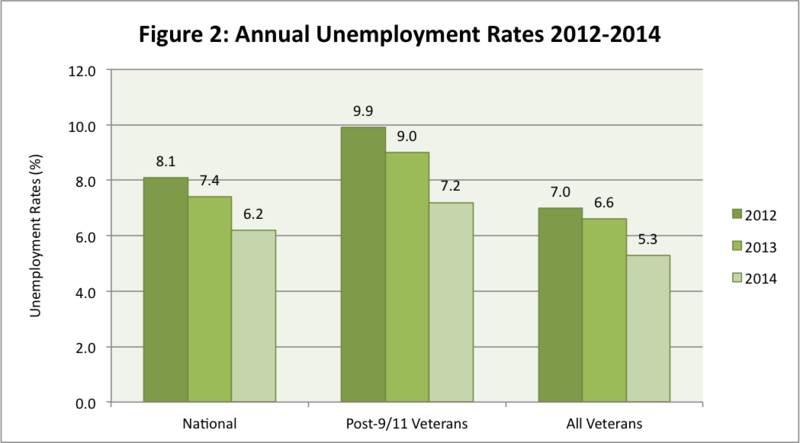 Unemployment rates have been steadily decreasing for Post-9/11 veterans over the past few years (see Figure 2). While annual averages show that veterans overall experience lower rates of unemployment compared to the nation as a whole, this is still not the case for our most recent veterans. 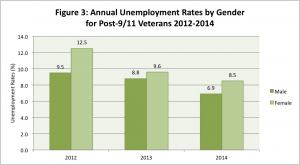 Post-9/11 veterans have consistently experienced unemployment rates that are higher than both of these groups from 2012 to 2014, indicating a need for outreach, policy and programming aimed at improving the transition process for this population. Further, among our most recent veterans, some populations are still struggling more than others to find employment. 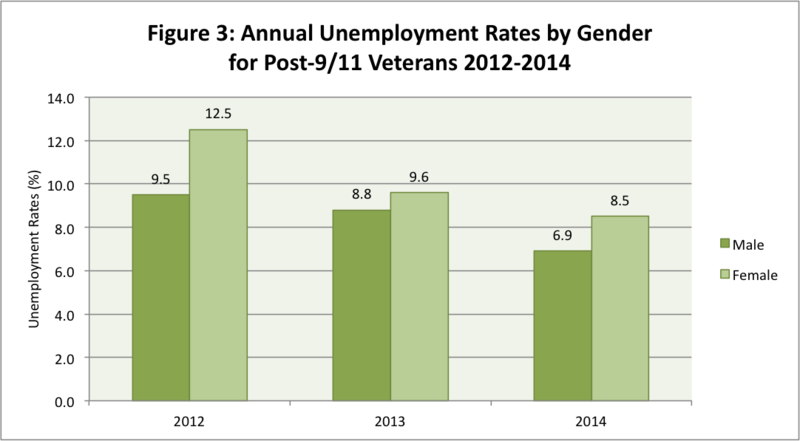 Women veterans have had a pattern of higher rates of unemployment compared to male veterans over the past few years (see Figure 3). Although women veterans have seen their annual unemployment rate decrease from 12.5 percent in 2012 to 8.5 percent in 2014, this is still much higher than the 6.9 percent unemployment rate male veterans experienced in 2014. Last year, IAVA published the results of our 2014 Member Survey, where our members identified employment as their top challenge in transitioning out of the military. Although progress has been made, this new generation of veterans particularly continues to experience challenges to employment. With the end of the U.S. combat mission in Afghanistan upon us and a continued troop withdrawl through 2016, the next year will be a crucial time to establish a path forward for the successful transition of veterans’ to civilian life after service. Now is the time to ensure that all of veterans are returning to fulfilling educational and career opportunities, including women and minority veterans. The next year will also be key to ensuring that veterans not only find employment, but also maintain it. In 2014, multiple reports were released emphasizing the importance of retaining veteran employees and connecting veterans to meaningful work after service, including the RAND Veteran Employment Report and the VetAdvisor and IVMF report. If we are to move forward as a nation, we invest in the leadership experience and skills of our veteran population. This starts with employment after service. 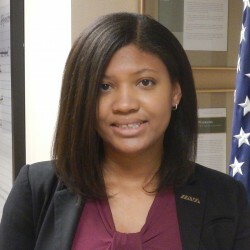 For more specific suggestions to improve employment outcomes for veterans see IAVA’s 2014 Policy Agenda.